Centennial editions of the Winged Liberty dime, the Standing Liberty quarter, and the Walking Liberty half-dollar will launch in 2016, the United States Mint announced on Tuesday, Nov. 10. This news was expected. The U.S. Mint previously discussed plans to commemorate the 100th anniversary of the three designs and in June revealed mock-up images for possible gold versions. The 1916-dated coins were in .900 fine silver. Next year’s centennial coins will bear the original designs, but instead have a composition of .9999 fine 24-karat gold. They will feature dimensions meant to approximate their 1916 counterparts. As such, the dime will contain one-tenth troy ounce of gold, the quarter will contain one-quarter troy ounce of gold, and the half-dollar will contain one-half troy ounce of gold. 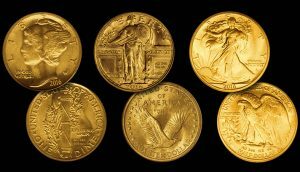 In addition to the standard inscriptions on the original issues, the centennial gold coins will also have "AU," "24K," and "1/10 OZ," "1/4 OZ", or "1/2 OZ." The U.S. Mint has not stated which of its facilities will make them. In recent years, the U.S. Mint at West Point has produced all gold coins. The agency has also not said what finish or finishes the coins will have. The Winged Liberty dime, designed by Adolph A. Weinman, features a likeness of Liberty facing left while wearing a winged cap. Many know it as the Mercury dime because of its similarity to the Roman god Mercury. The coin’s reverse (tails side) offers a Roman fasces and an olive branch, representing America’s military readiness and its desire for peace. The Standing Liberty quarter, designed by Hermon A. MacNeil, shows Liberty bearing a shield and an olive branch as she steps through an opening in a wall bearing 13 stars. The reverse depicts and eagle in flight along with 13 stars. On the half-dollar is Weinman’s iconic Walking Liberty design, which portrays her striding toward the sunrise. Liberty is carrying branches of laurel and oak in her arms while wearing a Phrygian cap with an America Flag flying behind her. The reverse shows an eagle rising from its mountaintop perch. Mintages, release dates and prices for the centennial editions will be available next year, the U.S. Mint said. I agree Joera and even wrote the Mint a year ago suggesting these in high relief proof silver, possibly with double dates. Got back a non-committal answer, but apparently people there were thinking of something along the same lines. In looking at it further there seems to be some law that blocks the Mint from issuing silver coins without Congressional approval, if so I guess they didn’t want to go that route. Regarding including the inscription of “AU” on these gold coins, AU is the chemical symbol for gold, because Aurum is the Latin name for gold. However to some people, “AU” may also mean Almost Uncirculated. The Mint is probably “working” with the big buyers on how they can “participate” in this special. Wouldn’t surprise me if the Mint comes out with an absurd HH limit (like the 50 per HH on the HR) as part of that “participation”. Kinda sad they have to mar the design with the added info. Like that is really necessary or will stop those wanting to knock them off from doing so? I think what it is is a certification/guarantee by the US Mint of what the content of the coin actually is. Important in dealing with bullion which these could be thought as. Dimensions meant to approximate their 1916 counterparts – been a long time since I’ve seen a 1/10th ounce gold coin but I wonder about the thickness of the centennial coin compared to a silver dime from 1916. Still, I’m glad they’re keeping the designs as close as possible to the originals and I can’t imagine a centennial coin set not containing the same amount of silver as the originals. I would imagine these three gold coins would be the same size as the proof gold American Eagle 1/10 OZ, 1/4 OZ, & 1/2 OZ, coins. But in 24K, not 22K, like the gold Amercian Eagle. Probably a bit smaller since 22K is an alloy where 24K is pure, so more gold. Unfortunately, the bill that was signed into law only had 24k Gold coins listed to be minted for the 100th anniversary. I compared the thickness of the 1/10 oz. gold uncirculated Eagle with the silver Winged Liberty Dime, or as some people know it as “Mercury Dime,” and the 1/10 gold Eagle is smaller in diameter and thickness. The diameter is not that much different but the thickness is very noticeable. Or it is to me anyway. To the point that I was surprised how small the 1/10 oz. uncirculated gold Eagle was. But that is just my opinion. And the use of 24K might make a difference in the dimensions. But I really don’t know if 24K & 22K will make a difference. And I agree with you on a centennial coin set with silver. After al it is to commemorate three original silver coins. This will be a classic set worth having. I’m looking forward to this. I am a numismatist, not a mathematician per se, but if your calculations are correct then we will need a microscope to see the U.S. Mint’s 2016 24-karat (99.99% fine) Winged Liberty Head gold dime! Of course there are some private Mints (B.H. Mayer in Germany) & some government Mints (Perth Mint Australia & Royal Canadian Mint) that are striking legal tender coins composed of 0.5 grams of 24-karat gold ! These issues are known among collectors as “button coins.” Maybe the U.S. Mint is planning on selling these 2016 24-karat gold “Mercury Dimes” with a 10x loupe as a set! At least the U.S. Mint hasn’t produced any hideous, atrocities such as colorized coins – YET. But that is another horror story for another day IMHO ! Happy collecting everyone. The 90% Silver Winged Liberty Dime has a diameter of 17.9 mm, thickness of 1.35 mm and weight of 2.50 grams. For comparison, the 1/10 troy oz. 22k American Gold Eagle has a diameter of 16.5 mm, thickness of 1.19 mm and weight of 3.393 grams. Since 24k gold is 9.09% denser than 22k gold, a pure gold dime should be 9.09% smaller than the 1/10 troy oz. 22k American Gold Eagle by either having a smaller diameter and/or being thinner. For comparisons as to what to expect for the size of next year’s 1/10 troy oz. pure gold 2016 U.S. Mint Winged Liberty Centennial Dime, the Royal Canadian Mint makes a 1/10 troy oz. Canadian Maple Leaf Pure Gold Coin having diameter of 16 mm, thickness of 1.22 mm and weight of 3.11 grams. The Austrian Mint makes a 1/10 troy oz. Vienna Philharmonic Pure Gold Coin having diameter of 16 mm and weight of 3.11 grams. The Perth Mint makes a 1/10 troy oz. Australian Kangaroo Pure Gold Coin having diameter of 16.1 mm, thickness of 1.3 mm and weight of 3.11 grams. The Royal Mint makes a 1/10 troy oz. Britannia Pure Gold Coin having diameter of 16.5 mm and weight of 3.13 grams. These 1/10 troy oz. pure gold coins are practically identical in size. The U.S. Mint is leaning heavily toward business strikes only, meaning no proof or uncirculated versions. Regardless, these are on my “Must Have” collecting list for 2016!!! My biggest question would be that if these will only be available in “Business Strikes” will they then Only be available from Dealers like the current Business Strike Silver Eagles are sold? I agree with Jim that the sizes of the 2016 pure gold dime, quarter and half dollar would have to be similar to the 2008-W Buffalo Gold fractional sizes. The ½ troy oz. 2008-W Buffalo Gold had a diameter of 27 mm & thickness of 2.24 mm. The ¼ troy oz. 2008-W Buffalo Gold had a diameter of 22 mm & thickness of 1.83 mm. The 1/10 troy oz. 2008-W Buffalo Gold had a diameter of 16.5 mm & thickness of 1.19 mm. In order to make a pure gold Walking Liberty Half Dollar with same diameter of 30.60 mm as the 1916 silver version, then it would be the same size as last year’s 2014-W JFK 24k Gold Half Dollar that weighed 0.75 troy oz. Ed – many thanks for taking the time to analyze so many possible options. FWIW I _am_ a mathematician as well as a collector so I really appreciate your thoroughness. I guess if I had my druthers I’d prefer if the Mint aimed to keep the coins’ diameters as close to the originals as practical. They’ll generally be packaged, slabbed, etc. ; even if the thickness is reduced below 1 mm it would seem (at least semi-naïvely) to not be detrimental to their integrity. I believe that is exactly what we will get. Gold coins that will be the same diameter as their respective 1916 (silver) coins but will be thinner as required to accommodate. I’m a newcomer to the numismatic scene and have started buying only coins that I like. When I find a specific coin I like, I’ll buy it, even if it means pulling it out of a set, if I don’t like the rest I won’t buy the rest. One of my recent purchases that I am completely in love with is my March of Dimes 2015 P Silver Rev-proof PF70 dime. I’m happy to hear that there will be a minting of a 100th anniversary Mercury dime, seeing as how that is one of the coins that got me interested in this great hobbie that is coin collecting. Having collected these coins in my youth they are the most beautiful minted coins the U.S. has ever produced. I don’t like to see them cast in gold, would rather see them in silver and of their original dimensions and make it a 3-coin set. I think the coins will remain the same size…at least very close to the original size. However, the composition will be different. The mint was authorized to change coin composition. I beleive it was approved by our President B.H.O. A few things I ask…first limit the production. Second, give us normal people a shot at making purchases…not to big sellers. Lastly, keep the original design add the weight or composition letters on the reeded edge…perhaps use some type of special minting like Scottsdale used on their limited one oz bars. They had a reeded edge type of design on one side (obverse) when looking straight on it looked like an oval but if angled the date would appear more visible. As it turns out for the specifications of the 2016-W Gold Winged Liberty Dime to be released on Thursday April 21, 2016 @ 12:00 PM EDT. its diameter is 16.5 mm, its thickness is 1.19 mm and its weight is 1/10 troy oz. By comparison the 1916 Mercury Dime had a diameter of 17.9 mm, thickness of 1.35 mm and its had a weight of 2.5 grams of 90% silver. As predicted above the dimensions match those of the 2008 $5 gold buffalo (also 1/10 oz 24k gold). I still wish they’d come out with a silver version same as the original 1916 mercury dime only with the 2016 date. Or with a set of gold and silver coins so that people can compare the two. So, about three weeks before issue date, when does anyone think the Mint will release more information on the Gold Winged Liberty Dime? Would be nice since the release date is so close now. Now that the mint issued the 2016 Proof Mercury Dime in the manor they did how do you feel snout the minitower listening to the little collectors?